Dog Day Afternoon (Now closed for the season) LET US TAKE YOU BACK 100 YEARS IN TIME! Experience the thrill of dog mushing hands on. Learn to harness and handle the dogs; relax as a passenger or drive your team of dogs with a guide. Spend time on a spectacular mountain trail and build a unique bond with your team of Huskies. Schedule 12 noon. This tour may be limited to certain days of the week. 3.5 to 4 hours of howling good times with fantastic picture opportunities. More personalized time with your team and guide; take a turn driving the team with your guide or relax as a passenger. Gourmet snack and hot beverage; choice of hot lunch (ask for current menu). Transportation from Canmore or Banff. Total tour duration with travel time from Banff is six hours; from Canmore 5 hours. All tours include the option to help harness the dogs, hook up the team, and drive the team - with the help of your experienced and friendly guide. We are the only company in the Bow Valley who guarantees one guide per sled for the customer service, safety, and security our guests and dogs deserve! Enjoy the scenery and reward the dogs with a cookie at the end of the tour. Be as interactive as you want! 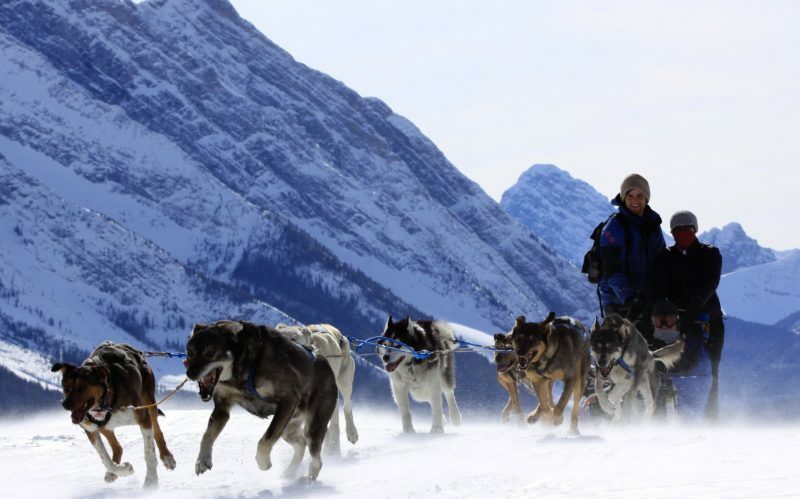 Our all-inclusive dog sled tours provide return transportation from all major hotels in Banff and Canmore, snacks and hot beverage, and personalized service with one guide per sled! Teams of 5 to 7 friendly Alaskan, Siberian, & Seppala Huskies take you through the Canadian wilderness of the Spray Lakes Provincial Park for the experience of a lifetime! Come howl with us and meet experienced Iditarod and Yukon Quest dogs! Available January through March, snow and weather dependent; minimum 48 hours notice is required. This tour may be limited to certain days of the week; not available during high season. Menu choices are required 24 hours in advance; if no choice is given, stew will be served. Trips are highly dependent upon trail conditions and weather; Howling Dog Tours reserves the right to modify or cancel on the same day. Howling Dog Tours provides transportation to and from the Spray Lakes area and most major hotels in Banff and Canmore. Rates are per person, plus 5% tax. Minimum 2 adult prices per sled. Minimum two adults per sled. Singles or groups of three permitted at our discretion. All prices listed are in Canadian Dollars and subject to applicable taxes (GST). Prices subject to change. Following are some of our Frequently Asked Questions. More answers to common questions can be found on our FAQs page. If you still have a question, please don't hesitate to contact us. This depends upon the time of the season. We book up quickly for Christmas week, Family Day/Valentines weekend, and Easter, so you should call at least a couple of weeks ahead. We do not take a deposit unless your group requires more than 2 sleds, so you can book as early as you want. We do take last minute (even same day) bookings, so don’t think it is not worth calling! There is no weight restriction for groups of 2. We can adjust the number of dogs on the team accordingly. If there are more than 2 people, we have restrictions based on height (space in the sled) and combined weight of the people. Do you take injured or physically impaired participants? Yes – because each sled we run is guided, we are able to accommodate most injuries/impairments. We will recommend that you take into consideration the temperatures – if a limb is immobile, there is greater risk of frostbite. We pick up at all major hotels in Banff and Canmore. Out of town guests can meet at our centrally located Canmore office, where there is ample free parking.